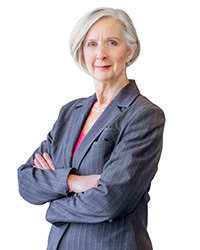 Wendy is a valuable contributor to KBRS's Consulting and Career Transition teams. She is one of the most experienced professional credentialed coaches in Atlantic Canada and has built an impressive reputation with leaders and managers through her confidential, one-on-one coaching relationships. Wendy thrives on building trust with her clients in order to create a safe foundation for open and honest dialogue. She is known for her superior listening ability and insight combined with her results-driven style of coaching. She has a reputation for helping clients gain clarity and creatively problem solve while holding them accountable at each stage. She trained in 2005 with Adler International Learning in Toronto and in 2007 earned her ACC (Associate Certified Coach) credentials from the ICF (International Coaching Federation). In 2013 she earned her PCC (Professional Certified Coach) credentials. In 2018 she will obtain her credentials as a (CMC) Certified Mentor Coach. Prior to her work with KBRS, Wendy was the Senior Manager of Communications for the CBC with responsibility and expertise in issues management, public relations, internal communications, promotion, marketing, brand development and special events for over 12 years. Wendy was one of 100 successful career women mentors for the Nova Scotia Lieutenant Governor’s Young Women Mentorship Program in 2003. She is a founding Board member of the International Coaching Federation’s Atlantic Chapter and served as President for three years and is currently serving as Past- President of ICF Atlantic. Wendy is also serving a four-year term as a member of the Board of Trustees for Phoenix Youth in Halifax and has been instrumental in growing the community of professional coaches in Atlantic Canada.